Atrazine is a chemical used in agriculture and horticulture to selectively kills weeds in crop fields and in warm-season turf lawns. More importantly, it is a restricted-use herbicide in the United States, limited to usage and application by certified professionals. The chemical disrupts photosynthesis in weed plants, effectively weakening and killing them since they no longer can produce food from sunlight. Atrazine also acts to stop seed germination as it tends to linger in the top 6 inches of soil. Atrazine is used both as a pre-emergent and post-emergent herbicide to control weeds. As a pre-emergent, it prevents germination of weedy broadleaf and cool-season grass seeds, and as a post-emergent it kills actively growing annual cool-season weeds. Atrazine is used in areas of the United States where warm-season grasses dominate. 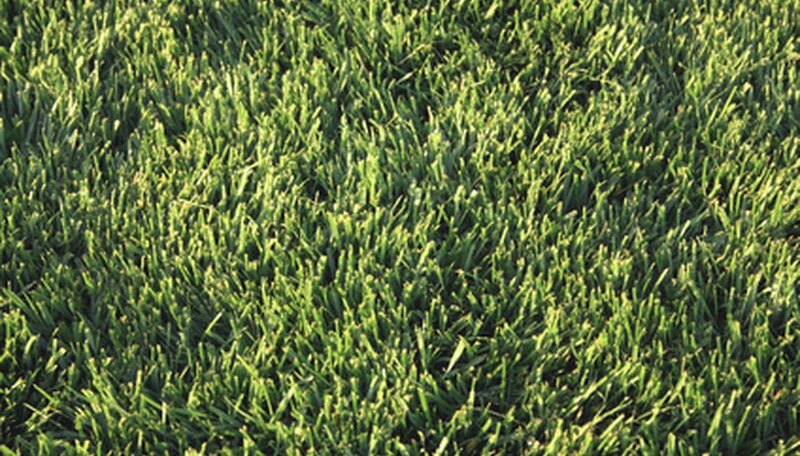 Such lawns comprise St. Augustine, centipede, zoysia or winter-dormant Bermudagrass. The herbicide kills cool-season grasses like annual bluegrass, which often germinate and become "weedy" during the moist, cool but mild winter months when the warm-season grasses turn brown in dormancy. Do not use atrazine on lawns made up of perennial ryegrass, tall fescue, Kentucky bluegrass, bahia and creeping bentgrass, according to North Carolina State University. Generally speaking, foliar spray application of atrazine is done only when temperatures do not exceed 80 degrees Fahrenheit. For the southern United States, that corresponds to fall, winter and early spring usage: October through April. Applying atrazine in temperatures above this results in foliar damage to the warm-season turfgrasses. Specifically, do not spray centipede and Bermudagrass at the time in spring that it is physically "greening up." Atrazine may only be applied by a certified professional in the United States. Consult product label directions for mandated personal protection equipment, dosages and other application procedures. Focus the spray applications on the lawn only. Do not spray bare soil near or the foliage of perennials or ornamental shrubs lining the edge of the treatment area. Do not use on any lawn when seasonal ambient temperatures exceed 80 degrees F daily. The European Union banned the use of atrazine in 2005 based on research that its runoff into freshwater bodies causes deformities in amphibians and other small animal life according the the Natural Resource Defense Council. Moreover, increased incidence of cancer occur in workers at the chemical manufacturing plants, suggesting it is carcinogenic in large dosages or prolonged exposure. It remains a restricted-use herbicide in the United States. The U.S. Environmental Protection agency will again evaluate atrazine in 2013 to examine new data and possible modify any rules regarding its use.